The Lapidus procedure as evolved over the last 50 years. What originally was a difficult procedure with poor outcomes has changed to a procedure that allows for ideal realignment of the deformity at its source, improved foot alignment, and minimal to no need for further surgery. The authors now use a weight bearing plate which has improved overall patient care, with a minimized risk of nonunions, and more rapid return to early weight bearing and range of motion. This method has opened up the procedure to more patients, decreased the recovery time, and allowed for early physical therapy, resulting in outstanding patient outcomes. The Lapidus procedure has long been considered one of the essential options for the correction of hallux valgus deformity. In a retrospective study of 47 feet, Catanzariti and colleagues1 found no cases of hallux valgus recurrence. The average intermetatarsal angle reduced from 13.8 to 2.1. Only 3 nonunions resulted and 2 patients did go on to a hallux varus. For years, the procedure was considered the ideal option for large bunion deformities and hypermobility cases. The procedure continued to gain favor as the procedure of choice for hallux valgus correction overall because the underlying cause of the hallux valgus deformity was the laxity and hypermobility of the first ray at the metatarsocuneiform joint. By correcting the problem at the source of deformity without the use of osteotomy, the true cause of the bunion deformity is being addressed . The main reasons for not performing the procedure were the high rate of nonunion reported and the need for non–weight-bearing status by the patient. However, these issues are not able to be addressed with the more recent advancements in procedural technique. Current recovery periods after the Lapidus procedure seem comparable to other first ray procedures, such as a base wedge or head osteotomies. One of the main concerns about the Lapidus procedure was the high rates of nonunion. Early reports suggest rates as high as 25%.2 More recent studies have demonstrated significantly lower nonunion rates. Patel and colleagues3 found a nonunion rate of 5.3% in a review of 227 Lapidus procedures. The main sources of nonunion seem to be 3-fold. These are surgeon error-related problems, including poor internal fixation, poor joint preparation, and poor postoperative care. Other concerns that need to be considered are poor patient selection such as smokers, patients with poor nutritional status, and those with inadequate bone quality. Another main concern, especially for the patient, is the prolonged period of non–weight bearing. The traditional recommendation has been complete non–weight bearing for a total of 6 to 8 weeks. This period is far longer than in head procedures but fairly equivalent to the amount of healing time required for base procedures. However, the authors present suggestions that have allowed them to keep patients ambulatory and limit the need for complete non–weight bearing. A third reason often used by surgeons to avoid the Lapidus procedure as an option is that the incision usually is large and cosmetically may not be pleasing to the patient. We will also present our current treatment with a dual incision system, which has made our outcomes similar to any cosmetic-type head procedure with regard to incision healing.The final myth to be considered in the use of the Lapidus procedure is that limiting the movement of the first ray results in an abnormal stress on surrounding joints when compared with an osteotomy of the first ray; this is low on the scale of concerns noted by surgeons but has been addressed for completeness. In our 15-year follow-up history of patients undergoing Lapidus procedures, we have found no cases of surrounding arthritis from transfer of pressure. Furthermore, in dozens of patients with unilateral surgery performed, mainly because of previous surgery on the contralateral limb other than a Lapidus procedure, we have noted a dramatic difference in the rate of arthritis associated in surrounding joints on the non–Lapidus surgery foot. This condition may be because the first ray is still mobile, or possibly hypermobile, at the first metatarsocuneiform joint, which results in pressure transfer to the second ray, third ray, and naviculocuneiform joint. Patient selection is essential for proper and ideal outcomes after Lapidus procedure. What is presented is our personal selection process after 20 years of performing the procedure. Other surgeons may be either more liberal or slightly tougher on patient selection, but we have found our results consistent and solid with the use of the following patient selection criteria. The patient must be able to understand the reasoning behind the procedure and the critical role they play in an adequate outcome. This criterion may seem simple but is the most essential part of the selection process. Patient weight, age, and bone quality can all be compensated for, but adequate understanding and compliance of the patient is critical and not under the physician's control. We have a deep and candid conversation with all patients, indicating the need not to smoke. Rates of nonunion with smokers have been dramatically higher than with nonsmokers. Patel and colleagues4 performed a systematic review of the literature and found that 13 of the 17 studies examined determined smoking to have a deleterious effect on bone healing. We do not perform the procedure in a known smoker, especially if the smoking is daily and more than a casual case. We also avoid the Lapidus procedure in patients who are not clear on the amount of weight bearing allowed during the recovery period. Although we can allow patient full and immediate weight bearing on the foot after the Lapidus procedure, we want the option of deciding on that option based on the surgical procedure and bone quality. Therefore, patient compliance and the understanding of patient weight level are essential. Patients also need to be nutritionally maintained, including bone quality and general nutritional factors. If a patient is considered questionable or if the surgeon believes there may be a nutritional issue with a patient, a vitamin level and possible bone density study may be performed. If bone quality is poor, the procedure is not performed. In most cases, the patient with minor to moderate bone density issues or vitamin insufficiency may be given vitamins D and B and may be referred to an osteoporosis specialist for bone density medications. We routinely have also begun using a vitamin pack for fusion cases, which includes vitamin B, vitamin D, and a stimulant for bone morphogenic protein, which seems to assist in bone healing and bone formation. Considerations for juvenile bunions are stricter. We believe that hallux valgus in a young teen patient requires more dramatic and sustained correction. We have made a general policy to primarily attempt a Lapidus procedure in patients who have juvenile bunions. There may be limited one-time considerations for other procedures, but our patient selection of juvenile hallux valgus has resulted in far better short- and long-term outcomes with the use of the Lapidus procedure. Another common source of debate related to the use of the Lapidus procedure is a patient with a short first ray. This condition has not been an issue in our hands. By using a curette technique instead of a joint resection technique and proper realignment of the ray in the sagittal, transverse, and coronal planes, a short ray can still be made to take proper weight in a virgin surgical case. In a case of iatrogenic shortening of the first ray from previous surgery, a Lapidus bunionectomy with the addition of a tricortical bone graft in the first metatarsocuneiform joint has allowed proper lengthening of the first ray and far better outcomes than an opening wedge procedure option. Finally, many believe that the Lapidus procedure should be avoided in hallux valgus cases associated with arthritis of the first ray. 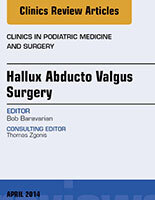 Although we do not disagree with such cases on the far range of hallux limitus, we do believe that stage 2 to 3 hallux limitus cases associated with hallux valgus may still benefit from a Lapidus procedure with proper alignment of the first ray, decompression of the great toe joint, and removal of the abnormal spurring and arthritic changes in the great toe joint. The patient is placed on the table in a supine position with a small bump under the ipsilateral hip to place the foot in a rectus position. Our preferred anesthesia is a popliteal fossa block with a long-acting local anesthetic and epinephrine unless contraindicated. Commonly, the patient receives a general anesthesia with the popliteal fossa block, as the block may take as long as 1 hour to take full effect, but in certain cases, a spinal anesthesia is used or appropriate time is taken for the block to take effect in which case mild or no sedation can be used. The reason for a popliteal fossa block is 24 to 48 hours of anesthesia for the patient after surgery, which has resulted in minimal need for pain medication and postoperative pain. A tourniquet is placed at the calf level. The main reason for this positioning is that a thigh tourniquet is often painful for the patient and an ankle tourniquet does not allow proper hand positioning for placement of the proximal to distal screw fixation. Before elevation of the tourniquet, a stab incision is made on the lateral body of the calcaneus and a bone marrow aspiration is performed with a 30-mL syringe and a Jamshidi needle. This bone aspirate is passed off the field, spun down and concentrated and mixed with a platelet-rich plasma taken from a vein puncture, and made into a gelatinous mix for later use. The Jamshidi needle is then used to harvest about 2 mL of bone graft from the heel to be used in the fusion site. The tourniquet is then inflated. Our most common incision pattern is a dorsal incision over the first metatarsocuneiform joint combined with a medial incision at the metatarsophalangeal joint. We have not found it necessary to perform an incision in the first interspace and, rarely do we use an extensile dorsal incision. An extensile dorsal incision is used in revision cases with a previous incision or if a large fixation plate is necessary. The incision is taken to the level of the tendon retinaculum protecting the neurovascular structures. The retinaculum is freed linearly and protected for later repair. The dorsal metatarsocuneiform joint is first opened. It is essential to protect the capsule for later repair, as it is one of the most important sources of nutrition and circulation to the joint. The joint is then distracted using a retractor of choice. Our preferred retractor is a Weinraub retractor, which allows k-wire pins to be placed in the first metatarsal and first cuneiform, which are then incorporated into holes in the distractor, which can then be spread open. The holes for the k-wires are made in the desired position for later screw placement. Following distraction of the joint, the cartilage is removed primarily with the use of an osteotome by hand. The osteotome is scraped against the cartilage, with limited to no removal of the subchondral bone. The plantar surface may need to be reached with a small straight rongeur or a small curette. It is okay to remove some minor subchondral bone on the edges or the plantar surfaces of the joint, but it is essential to leave the central portion intact, as this is the site the screws pass through the actual joint region. The subchondral bone is then fenestrated with a combination of 0.062 k-wire under lavage and a very small bone osteotome for shingling. The region is lavaged and protected while the first metatarsophalangeal joint is exposed. A medial incision is made in the first metatarsophalangeal joint. The joint is opened through a dorsal medial incision with a wedge taken out linearly for the redundant joint capsule. The size of the wedge taken out is based on the size and medial shift associated with the first ray. Minimal capsular dissection is performed to allow lateral release of the sesamoid collateral ligament. This procedure is done from an intra-articular approach. After the lateral sesamoid release, the lateral capsule is checked, and if tight, an intra-articular lateral release is performed through the lateral joint capsule. The toe is gently stressed medially to stretch the lateral capsule and ligaments. The medial eminence is then removed, taking care to leave the plantar medial sagittal groove intact; this is essential to avoid increased risk of hallux varus. If the toe is still found to pull laterally, the extensor hallucis brevis is transected at the proximal midfoot incision site. In certain cases in which preoperative examination shows rectus position of the toe and medial realignment of the toe, it may be possible to not open the great toe joint at all and only shift the metatarsal with a first metatarsocuneiform fusion. This method avoids scar formation and stiffening of the great toe joint, although this has been of little postoperative concern in our hands. After proper release of the great toe joint, the gelled stem cell/platelet-rich plasma material is placed in the first metatarsocuneiform joint and the metatarsal is positioned to as close to a zero intermetatarsal angle as possible. The bone graft from the heel is used to fill any small gaps that may have been produced, and fixation is undertaken. Optimal internal fixation of the fusion site is essential for union rate and weight-bearing potential in the Lapidus procedure. Our initial fixation was crossed screw fixation, with the proximal-to-distal screw grabbing the metatarsal base. With this technique, we did not allow weight bearing for 6 weeks or until adequate fusion seemed to be taking place. With the addition of the stem cell concentrate, we have seen early fusion on patients at 4 weeks, which began to speed up weight bearing to 4 weeks. However, we believe early weight bearing was essential to make the Lapidus procedure mainstream and available for all patients. We began to experiment with different plate fixation options. We have currently begun to use 2 plate options that are selected according to patient size, bone quality, and need for immediacy of weight bearing. Both plates offer a combination of locking and nonlocking options. The 2 plates differ in construct according to size and thickness. The more common plate system used is 1.4 mm in thickness, which is low profile. Five plate options are available in the Stryker 1.4 mm set, which include plates different in shape and length. This one is essentially our primary set. In rare cases, we prefer a thicker and stronger plate, which is 1.6 to 1.8 mm in thickness at differing plate sites. This system by Orthofix (Lewisville, TX) is an excellent anatomic plate but far thicker. What is best about the Orthofix plate is that it may offer greater stability in a large patient with need for early weight bearing, and that is its primary use in Dr Baravarian practice. The overall construct for fixation is done through crossing screws for primary compression followed by a dorsal medial plate fixation. The plate is positioned on the medial aspect to allow screws to run into the middle cuneiform and second metatarsal if need be.After fixation, the remaining bone marrow aspirate concentrate is injected into the nooks about the fusion site and allowed to gel. Closure of the capsules is performed using the surgeon’s choice of suture. Care is taken to close the first metatarsal-phalangeal joint capsule at a slight bias to medially shift the great toe and allow repositioning of the sesamoid complex. The initial dressing is placed, followed by a fiberglass below the knee cast. The patient is seen 5 days postsurgery for an initial wound check and for a new cast to be placed. To weight bear or not to weight bear? Our weight bearing habits have changed with an increased understanding of the healing process associated with the Lapidus procedure. Although screw fixation and weight bearing may be possible, we do not think cannulated screws allow adequate support for early weight bearing. However, with the additional bone marrow aspirate, we have seen fusions at as early at 4 weeks, which has allowed early weight bearing for some patients with simple crossed cannulated screw fixation. Our preferred fixation with crossed cannulated screws and a locking plate system has allowed us to begin early weight bearing, which was first started with partial weight at 4 weeks postsurgery. We then progressed to partial weight of about 20% at 2 weeks and gradually increased to 100% at 4 weeks. During the course of 2 years, this process was checked and no nonunions were seen. We have now progressed partial weight at 5 days postsurgery with increase to full weight at between 2 and 3 weeks postsurgery at which time sutures are removed. A removable boot is then fitted to allow range of motion exercises, physical therapy, and washing of the region. Boot removal and progression to a stiff shoe is usually at about 5 weeks. To date, we have still not seen a single nonunion in 3 years using this current fixation, marrow aspirate, and weight-bearing progression system. The Lapidus procedure is truly the ideal hallux valgus correction option. Return of the hallux valgus deformity is far lower with a Lapidus procedure than with other bunion surgeries, and that procedure allows for anatomic correction of the underlying deformity and joint laxity issues. The Lapidus procedure also stabilizes the medial column of the foot and decreases abnormal stress and potential arthritis of the midfoot and other metatarsal cuneiform joints. The Lapidus procedure also can help with reduction of lateral column compression symptoms associated with first ray elevatus. The commonly associated complications of the Lapidus procedure have included nonunion, shortening of the first ray, poor cosmetic scar formation on the dorsum of the foot, and need for prolonged non–weight bearing. During the past 5 years, University Foot and Ankle Institute has undertaken a new and contemporary approach to dealing with the aforementioned associated complications to make the Lapidus procedure more attainable to all patients requiring hallux valgus correction. To that end, we have taken the surgery apart and broken it down and improved the portions to create a better overall outcome. To avoid shortening of the ray, the only cartilage is removed and the subchondral bone is left intact and fenestrated. By not using a saw to make bone cuts, we have avoided the shortening issues. To avoid a long and possibly noncosmetic scar on the dorsum of the foot, we make a dorsal cuneiform region incision and a medial metatarsophalangeal incision. The medial incision heals well, and the cuneiform incision also heals with minimal scarring, and because both scars are smaller than one long dorsal scar, the incisions are “broken apart” and less visible. The nonunion and non–weight-bearing issues are dealt with in the same manner. We have augmented the fusion with a small amount of calcaneal bone graft and a bone marrow/platelet-rich plasma concentrate cocktail, which is placed in the fusion site. Fixation is achieved with a construct of crossing screws at the fusion site and a dorsal medial locking plate fixation system. This system has allowed us to begin partial weight bearing at 5 days and full weight bearing at 2 to 3 weeks, with return to stiff shoe gear at about 5 weeks. This result is comparable to other osteotomy-type bunion surgeries, including head osteotomies. To date, this construct has not resulted in a single nonunion, and we believe immediate weight bearing postsurgery may be possible in certain patient groups who do not have other complicating factors such as poor bone quality, high body mass index, or poor coordination. With time and increased research, foot and ankle surgery is progressing to a level never thought possible. Improved fixation and an improved knowledge of soft tissue and bone healing have allowed for dramatic advancements in hallux valgus correction and made the Lapidus procedure our preferred surgery.